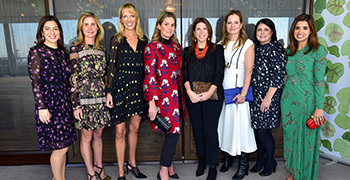 The benefit featured a lively conversation between Aerin Lauder and Stellene Volandes. The Playground Partners of the Central Park Conservancy Women’s Committee hosted its sixth annual Playground Partners Winter Luncheon at the Rainbow Room on Wednesday, January 30. The sold-out benefit featured a lively conversation between Aerin Lauder, Founder and Creative Director of AERIN, and Stellene Volandes, Editor in Chief of Town & Country. The funds raised support the mission of the Playground Partners’ to preserve and maintain Central Park’s 21 playgrounds. While reminiscing about raising her children in Manhattan, Aerin Lauder asked, “What would New York be without Central Park?” Stellene Volandes agreed with the sentiment and shared with the over 300 guests that her vow for 2019 is to walk in the Park every day. Alexia Leuschen, President of the Women’s Committee, was joined by the Luncheon Co-Chairmen Mary Beth Adelson, Talene Baroyan, Sana Clegg, Stephanie Hessler, Heather McAuliffe, and Emily McLellan, Women’s Committee Board Advisor, Karen T. May, and Playground Partners Committee Co-Chairs, Whitney Mogavero and Elizabeth Villar. Additional notable attendees included Gillian Miniter, Veronica Swenson Beard, Shirin Christoffersen, Kate Davis, Ainsley Earhardt, Tracey Huff, Sharon Jacob, Lauren Kenny, Kristy Korngold, Neda Navab, Margo M. Nederlander, Yesim Philip, Barbara H. Scott, Gigi Stone Woods, and Margaret Zakarian. Guests enjoyed magnificent views of Central Park as well as cocktails, a specially designed seasonal menu, and chic tablecloths donated by India Amory. The luncheon was sponsored by The Colony Hotel through the generosity of Sarah Wetenhall. The mission of Central Park Playground Partners is to maintain the quality and cleanliness of Central Park’s 21 playgrounds. The funds they raise go directly towards the preservation, care, and daily inspection of these play spaces. To learn more, visit centralparknyc.org/playgroundpartners.